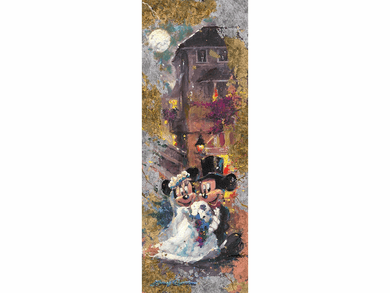 James Coleman Limited Edition Mixed-Media Gold and Silver Applique on Canvas Giclee:"Reflections of Love -Mickey & Minnie"
Image Size: 33" x 12"
Edition:Artist Hand Signed and Numbered Limited Edition. ncludes Certificate of Authenticity. About the Artist: James Coleman - a name synonymous with sweeping skies, tropical rain forests, rich deep woods and silent deserts. The images created by this talented man continue to delight all that view them. James Coleman was born in Hollywood, California in 1949. As a youth, his creative abilities seemed to dominate his world. Though he lacked the athletic skills of his young friends, he more than made up for it with imagination and ingenuity. As a young man, his interest in filmmaking and fine art would mark the beginning of a long, successful career in animated films. Coleman began his career with Walt Disney Studios in the summer of 1969, when his mother, who had been working as a secretary with Disney since the Hyperion days, got him a job in the studio's mailroom. His big break came when he entered one of his paintings in the studio art show. Several of the Disney artists viewing his work, saw his potential and realized he had an untapped ability and encouraged him to go into animation background painting.